With the current economic uncertainly it is more important than ever for small and medium companies to make sure that the fundamentals of their business are strong. These executive business packs are designed to help you put some of the core fundamentals in place to allow you to create the right environment for your business to succeed and move forward. Financial Accounts – one of the main reasons many businesses fail is poor cashflow management. Our accounts package will allow you to analysis your data month on month as well as with year end calculations. Services Agreements – a good service agreement can set the stage for good customer relationships. They are important for both the person providing a service and the one receiving it. Our packs all include these, offering safety for both sides. Terms & Conditions – Having the right terms and conditions in place is one of the most vital safeguards you should have in place for your business. These are in all our packs, with the specific industry packs having them relevant to the industry. They provide trading certainty, manage customer expectations, comply with the law and therefore, most importantly for any business, save you money. These are just a few of the main areas that these packs cover. Don’t be caught out thinking that you won’t need these. No matter what type of business you have you must make sure your business is covered for any eventuality. The well-used warning applies well – ‘devils lurk in the detail’. Make sure that you have all the fundamentals in place to maximise the opportunity for your business to be a success! Don’t delay, get compliant today!! Pre-made packs of documents and templates for all of your business needs. All sizes of business covered from Sole Traders to Limited Companies. Packs include guidance to help you get on your feet quickly. Up to date content based on current and upcoming legislation and governance. We are a new company - set up in February 2017 - with a clear mission to offer online business packs that will help new and established companies operate efficiently thus avoiding potentially, crippling financial penalties that accompany legal breaches. This executive Company Secretary pack includes all the guidance and forms that Limited Companies and existing businesses need to be compliant with Companies House. 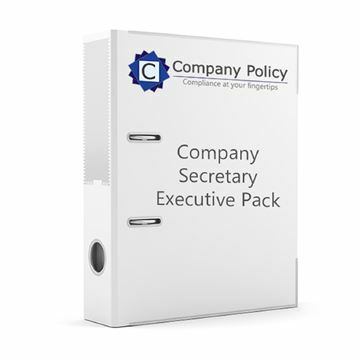 As there are now many Companies that no longer have a company secretary, this pack will provide comprehensive and invaluable guidance to directors and administrative staff that are carrying out the 'Company Secretary' role. Also included is a finance section that will enable you to start to complete your accounts from day one. This will help reduce your year end accountancy fees. As regulations are constantly changing we offer an annual update service that will ensure that you stay compliant. This pack contains a range of basic documents that will allow you to begin the process of working towards GDPR compliance. GDPR regulation will be implemented on the 25th May 2018. We have also included the Business Continuity documents to allow you to put your plan in to action. As a human race, we are constantly striving for easier ways of doing things: simpler, faster and more practical. Thanks to better tech, you can now interact with people globally and instantly with the click of a few buttons. Likewise, you can also physically move quickly due to advances in transportation technology. When it comes to the age-old practice banking – the same is now happening. Provided you have the necessities, a passport, residential address and a mobile phone, you can now open a bank account within minutes. This is brought about by a Fintech offering better known as Open Banking. No one disputes the importance of guarding the privacy of consumer information. But the recently enacted California Consumer Privacy Act (CCPA) threatens businesses with potentially crippling liabilities, while also harming consumers who benefit from innovation (including new ways to use data to offer personalized services and product recommendations) and enjoy free services made possible by data collection, processing and usage. Over the past few weeks I have read many posts here on linked-in about IT Security and do we go back to the basics and start all over again! I did comment on one of the posts, by saying going back to the basics is not the answer, new technology can protect your business, but everyday since writing this, it really did make me wonder what is required for businesses in today's new landscape. So i decided to go back to the basics and look at it from a different perspective, and each time i got different analysis. Here is why!